1. They will become lifelong avid learners. Children love play, and play is how they learn everything from how to socialize with others to balancing on a high beam without falling down, which is necessary for their physical development. They also constantly wonder. They wonder how planes fly; why we walk on two feet, while dogs walk on four. Turning their curiosity into play, instead of dismissing it with a short answer will make them see it as an act to continue nurturing. Children who see knowledge as fun will become lifelong learners, enthusiastic to continue to explore their wonder. 2. They will discover how to learn on their own. Encouraging children to figure out answers to their questions on their own will boost their self-confidence and independence, as well as teach them how to learn overall. As adults, we constantly find ourselves in situations where we neither know the answers nor where to find them, which can be a frustrating process for many. Children who are used to discovering answers independently carry the habit throughout their lives, not getting intimidated by this process. 3. They will become more observant and better at understanding their environment. Children who see their wonder being celebrated will continue looking at the world through wonder-filled eyes. They will become more aware of the people and environment around them. This will help them to better understand the world they live in and feel more responsible towards it. 4. They will be more open to trying new things without fear of failure. As any scientist would tell you, the majority of experiments we engage in don’t end up working out. Even if we get one positive result, we often don’t get the same result until we repeat it over and over again, paying close attention to all the details. This is the nature of a scientist’s work, and we get used to this kind of failure. In short, a negative result does not deter us. It makes us push forward, retrace our steps, and do it better next time. Children who are used to experimenting will also get used to this way of thinking, eventually overcoming the fear of trying new things and failing. 5. They won’t be afraid to question anything. Rather than accepting things the way they are or the way they are told to them, children who are used to the scientific way of thinking will continue to always ponder why. Pushing the boundaries, they will try to find their own answers. So, how do you encourage your kids to think like a scientist? Let’s start with an example: Say you have a little one at home who is not a big fan of washing his or her hands after playing outside and before meals. You tell them repeatedly that they have to wash their hands because they are dirty and need to be cleaned. You even explain that germs can potentially make them sick, and the only way to get rid of them is by washing. Since children can’t visualize these mysterious “germs” with their own eyes, it is very hard for them to understand why they have to wash their hands to get rid of them. The following six steps would help make your little scientist understand why he or she has to wash their hands through a fun experiment, and help walk parents through methods to continue encouraging scientific thinking. 2. Set up the experiment together. One of the best ways to see “germs” are agar plates, which are petri dishes that are used by microbiologists all around the world to culture small organisms and bacteria. You can find ready-to-use bacteria science kits on Amazon that are safe to use for children five years and above. Introduce your little microbiologist to agar plates and explain to them how these plates can be used to visualize bacteria: wipe a test area with a sterile cotton swab and then streak an open-plate surface with the swab to transfer the bacteria. Cover the agar plate and place it in an upside-down position near a heat source. Within 12 to 48 hours, you will be able to see bacteria cultures forming on your plate with your own eyes! To make it more fun, make them wear a white lab coat (an oversized white shirt would work), goggles, and even latex-free gloves. 3. Help them come up with a testable hypothesis. Before you start your experiment, think about what you want to test. Since your children may want to see how much dirt they get rid of by washing their hands, swab their hands before and after washing in two separate plates. Perhaps add more surfaces to the experiment as well. Your pet’s feet, or under the fridge, just to name a couple of examples. Then, come up with a testable hypothesis. For example: if washing your hands really does rid them of bacteria, then there should be less cultures forming on the plates after washing them in comparison to before. 4. Get their hands (and yours!) dirty. Now, the fun begins. Make your little ones go outside and get their hands as dirty as possible. You can try different conditions on different plates. Perhaps test out their hands after touching mud, the garden, the kitchen floor, etc. While you’re at it, get your own hands dirty and test them, too. Wash your hands thoroughly and swab them again. Then, swipe all the plates with the swabs, close them, label each, and put them by a heat source to incubate overnight. Waiting until the next morning for the results will be exciting for the entire family! 5. Let them fail. Once the next morning arrives, it’s time to check the results. Count how many bacteria colonies (circular structures on the plate’s surface) there are in each plate. Check if your initial hypothesis was true. Are there really less colonies on the plates from your washed hands than the dirty ones? If so, great! Now your littles know why they should wash their hands. If not, that’s okay, too. Try to think of reasons why that might be. Perhaps you labeled the plates incorrectly? Human error is very common in scientific experiments. Maybe the swab you used wasn’t very sterile to begin with. Instead of making it a negative experience, make it a learning one. Come up with more questions and repeat the experiment with new conditions to test. 6. Have fun. Experiments are fun, and science is fun! The more they see you have fun, the more they will, too. Associating an event with emotions makes it a more permanent memory, and nothing will make them think of learning as fun more than remembering doing these experiments with you amidst all the laughter. 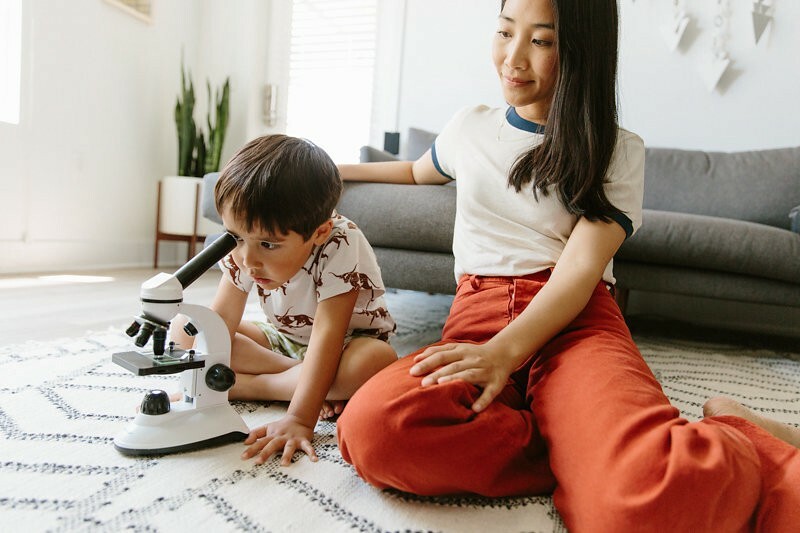 For even more on scientific thinking, check out How To Foster A Love Of Science In Your Kids & How To Raise A Lifelong Learner. Originally published at www.mothermag.com on June 14, 2018. Born in Istanbul, Turkey, Burcin is a neuroscientist and a science writer based in San Francisco. She has an endless curiosity to understand how our brains work, why we get diseases and how to cure, manage or prevent them. She has over 10 years of research experience studying neurodegenerative diseases, and is also passionate about promoting STEM education for children and making science and wellness accessible to everyone. Her writings have been published in Mother Magazine, as well as in scientific journals, such as Cell Reports and Neuron.